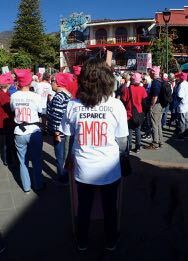 We started the day at the Ajijic plaza for the second annual Women’s March. Last year, we were travelling and I regretted that I wasn’t able to march in protest of the inauguration of our current US President. So I decided not to miss my chance this year, although this year’s theme seemed more general. A woman more artistic than me made the sign I carried, “Los derechos de mujeres son derechos humanos.” Women’s rights are human rights. My husband came along and took some great photos. At one point, he left the plaza to get a spot on the street where he could photograph the march approaching. He asked the police if he could stand in the back of their pick-up truck to take the photo — and ended up riding in the police truck along the parade route. How cool is that? 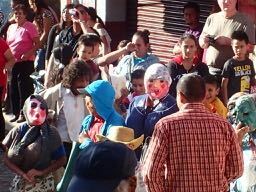 As we were walking, I had one of my most embarrassing moments ever in Mexico. (Yes, more embarrassing than going into the men’s room in a restaurant, which has happened more than once.) I was walking in the march when a young Mexican man with a large camera approached me and asked me if I spoke Spanish. I told him, “Un poco.” He proceeded to turn on the recording feature of his iPhone and start to interview me! I am guessing (and hoping) it was so awful that he didn’t end up using the footage. He asked me why I was marching. I understood the question, because really, I do understand Spanish if someone speaks slowly to me and uses the words you might use to speak to a 6-year-old child. But speaking? I speak it in my head. I answered him very simply (Porque creo en los derechos de mujeres!) and then completely bombed the follow-up questions, not being able to translate fast enough in my mind to form coherent sentences in Spanish. Of course, a few minutes after this, I thought of a bunch of things I could have said, know how to say, that would have been fine. But alas, it was all in my head, and much too late. <sigh> What an idiot I am, living here, and being so inept. Of course, who knows how cogent I would have been in English when faced with a reporter … but likely a lot better than I was in Spanish. I enjoyed the Women’s March, being with like-minded people, although it felt odd to be participating in one in Mexico. I am not protesting anything in Mexico. I don’t know enough about the politics and women’s issues here, I’m not a citizen, and don’t feel it appropriate to comment or protest on anything Mexican. Most of the people marching were from the US, some from Mexico, some from Canada. I think people were largely incensed with, and protesting, the anti-woman, anti-immigrant, anti-human actions of the US leadership. But we were doing it here, because, well, here we are. 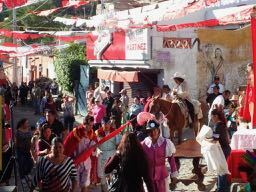 Our second event of the day was the San Sebastian procession and fiesta in the upper village area of Ajijic. 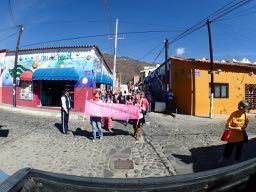 If the Women’s March was largely a gringa(o) event, the San Sabastian procession and fiesta was almost 100% Mexican. 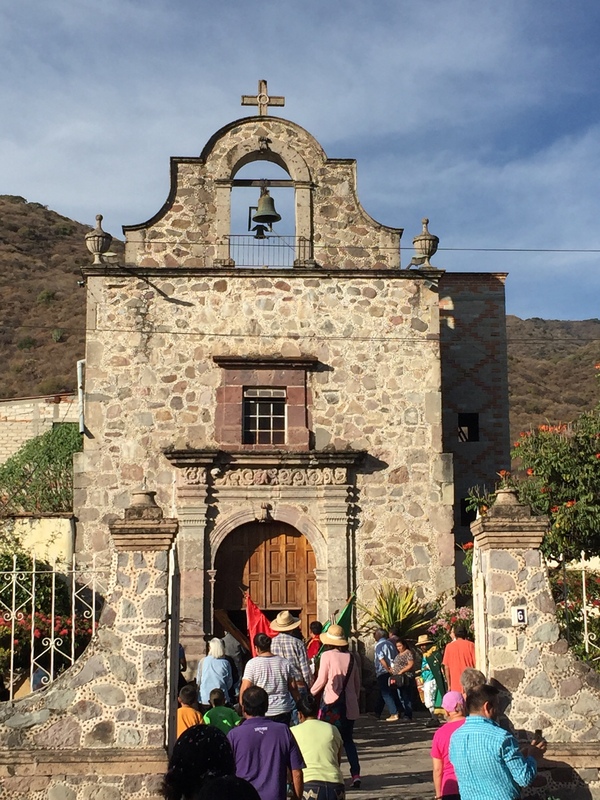 Earlier that day (6 AMish), the statue of San Sebastian was taken from the chapel on the plaza and processed up to a small shrine in the upper village where Mass was said (and menudo was eaten). 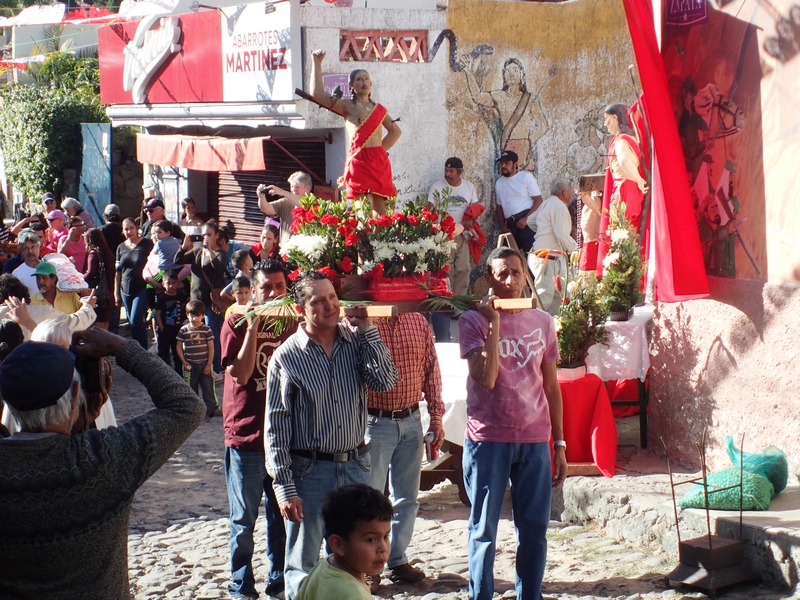 We joined the procession to bring him back to the chapel at about 4 PM. 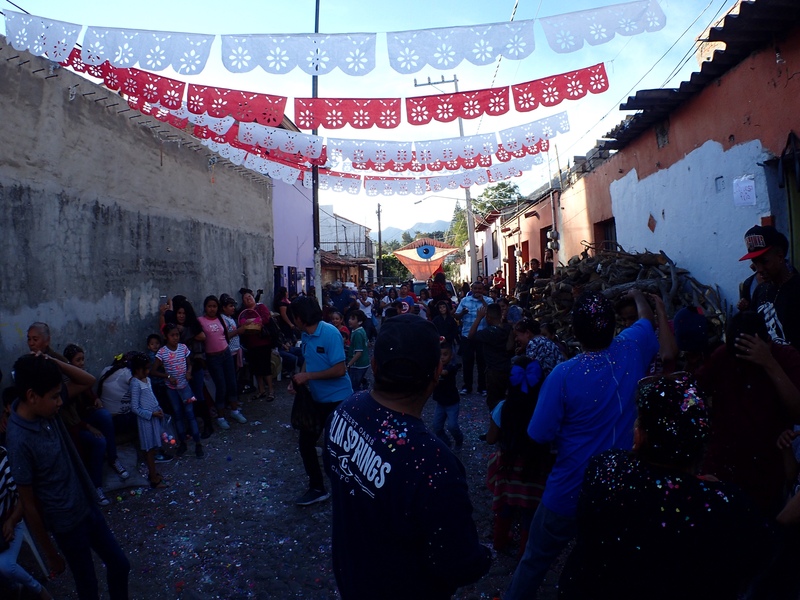 The procession had marchers carrying the statue, men carrying a tray of cakes and pots of food, a guy lighting off cohetes (bottle rockets), costumed dancers, floats in pick-up trucks, and folks throwing confetti and candy. After replacing the statue in the plaza chapel, the group made its way back to the upper village for the PARTY! 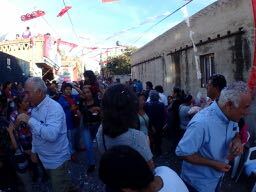 Cups of tequila-infused ponche were distrubuted, beer was sold, a band was playing, and then the big “fight” started. 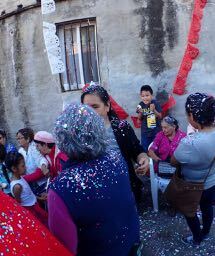 Everyone (aged 2 to 80+) had brightly-colored confetti-filled eggshells and started breaking them over people’s heads. Some nice folks gave us some so we could participate as well. It was a blast! And during all this mayhem, a lovely woman with a big smile, about 10 years younger than me, approached, again with the question of whether I speak Spanish. And again, well, I speak it in my head. She hugged me, welcomed me to Ajijic and to the party, and gave me a confetti egg. She later introduced me to some of her relatives. How sweet is that? After the US has fucked Mexico so many times, a kind woman welcomes me, the inept foreigner who can’t speak her language? I feel it in my heart, a warm sweet pain. As dusk fell, the party cranked up a notch. The band was fun, lots of cumbia music. We danced and drank beer. 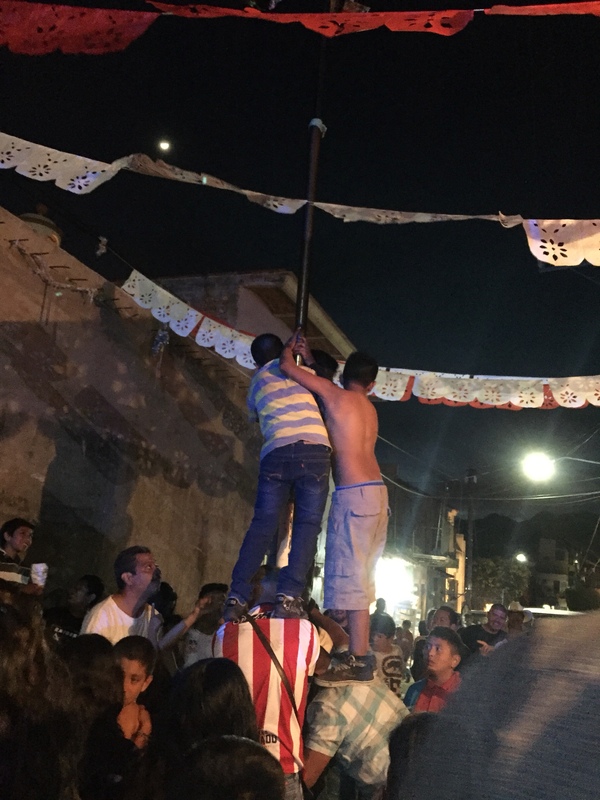 A greased pole had been erected in the street with toys hanging from the top. At a certain point, boys began to try to climb it. Men stood to form the base, hoisting boys onto their shoulders, and then more boys on top of those boys. Many times, everyone slid back down to the disappointment of the crowd. One of our friends and my husband decided to help (my husband thinking they needed a tall gringo to get the boys up higher), and finally there was success as a boy managed to get to the top and pull down the toys. Cheers!! A few minutes later, another lovely lady found my husband and our friend and gave them each a Tecate beer in thanks for helping the boys. Two events, a lovely day, and the same conclusion: I need to speak Spanish out loud, and not just in my head if I want to connect with all the kind, interesting, fun people around me. Viva Mexico! I’m a lucky gringa to be here and I appreciate it every day. 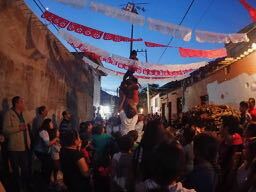 This entry was posted in Mexico and tagged Ajijic, San Sebastián, women’s march on January 22, 2018 by czelazek. Wonderful post, Christina! The part about a sweet pain made me cry, in sympathy. I understand about speaking in your head; I remember similar instances in Italy. Good for you for continuing to work on learning and trying, it’s a little by little thing. 🙂 I’m so glad you both are having such an amazing experience in Mexico, what a wonderful and inspiring journey. Big hugs!! Thank you so much! Language, yes, poco a poco!